Learn all about our talks, roundtables, and recruiting plans. It’s that time of year again! Game Developers Conference (GDC) will be kicking off on Monday, March 18 and developers from Naughty Dog will hosting talks, roundtables, and recruiting activities throughout the week! If you’re going to be in San Francisco and at the event, be sure to check out the schedule below to hear from our members of our team and learn more about our studio, our approach to development, and our open roles. Summary: Who wants to ride an elephant in a Naughty Dog 'Uncharted' game? According to play testers, everyone. Aren't wild elephants dangerous? Yes. How do you keep this plausible while still supporting the need of the narrative? Design at Naughty Dog often influences story, and story, design. Sometimes, the Naughty Dog team has a design idea so unusual and unique they find a way to incorporate it into the story no matter the complexity and cost. From background character to full, peaceful story moment, this talk covers the story and design evolution of the elephant ride in 'Uncharted: The Lost Legacy'. Summary: Multiplayer games are getting more complicated by the day, developers are starting to manage player counts in one session upwards of 100 players for some very popular modern games. In this roundtable session, attendees will talk about server development practices that range from small, non-intensive, simulations to large scale simulations with ever growing player counts. Summary: In the 2nd roundtable session, participants will delve into development best practices. Topics include how programmers can more easily test code that requires many users, and what tools have developers made that give designers the power to make their gameplay scripts network aware? Summary: The last roundtable session will be less technically focused. Here attendees will discuss the multiplayer space as a whole. The discussion will go over the successes of the past, the current direction of the medium, and dig into what developers wish to see in the future. Members of our incredible recruiting team will be around all week meeting with developers to talk about our open roles and sharing updates from the event. 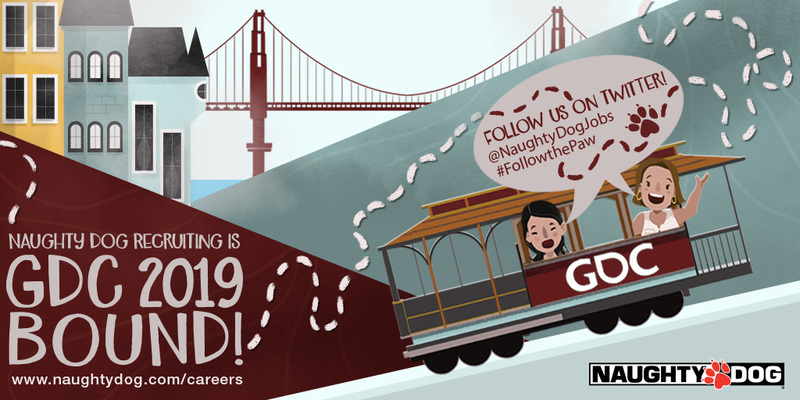 Be sure to follow @NaughtyDogJobs and the hashtag #FollowthePaw to get updates on where and when to find them throughout the show! As always, keep an eye on NaughtyDog.com and follow us on Twitter, Facebook, and Instagram for all the latest from the studio. Uncharted: The Lost Legacy Photo Mode Contest Winners! Check out these stunning Photo Mode creations from our amazing community. Attending Game Developers Conference? Don't miss these talks featuring Naughty Dog devs.